Not that much has changed with my desk since the last picture I posted here aside from my E1200&P5K -> 9950BE&MA790GP-DS4H move. And yes, that is a 120mm Sanyo on the stock CPU heatsink w/ cardboard duct. :P Speed controlling rotary switch located under 3.5" bays. I also have an acer aspire one, I got the 160gb version from walmart 30% off for xmas. Noisy pics for the win! Sweet setups. 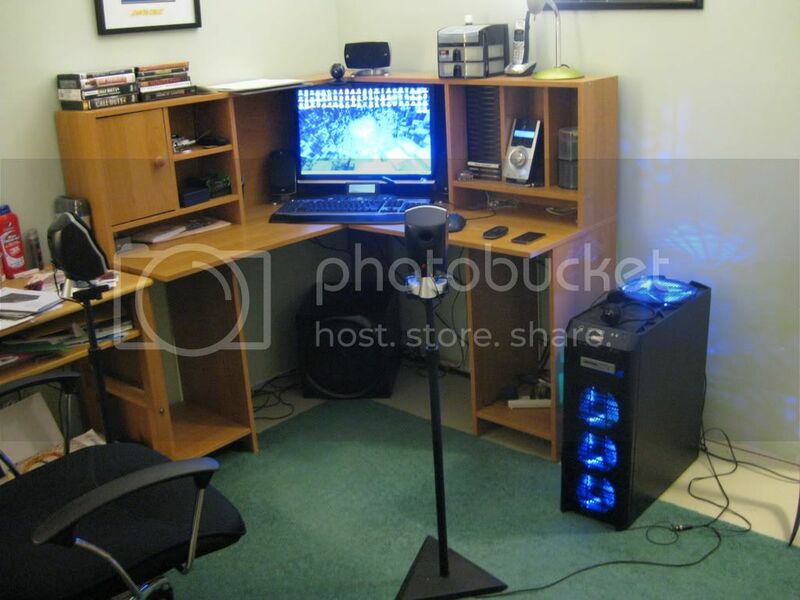 I still cant stand corner desks though, not sure why. It was hard to get used to, angling the way your arms lean on the desk.. but it saved so much space and made my sound more... surrounding. Jake, don't you worry about knocking down the rear satellites? I have them zip tied to the stands, trust me, they've had better times I usually catch them by the time they tip all the way down... if it weren't for the zip ties, they'd be toast!